I blogged about For the Makers a while ago, I absolutely love this idea! Each month they send you a box filled with craft supplies for you to make 4 projects. I think it's so great so you don't have to go buy a whole box of whatever craft supplies to make 1 little project .. they send you just the right amount you need. So brilliant. I'm a huge DIY lover! What I love most about it is the sense of accomplishment and pride. You can look around your home and see the hard work and how well it paid off. The best. What a WONDERFUL idea. I like doing crafts but never seem to have enough supplies. There is something special about making it yourself...a little piece of you goes into each project. I love being able to say that I made it and make something just the way I imagined! It's cool, did not know about "for the makers", but I just visited their blog and it looks very interesting. PS: I started following them on Facebook as "Marcela Bs". This is seriously such a great giveaway. Love this! Such an amazing giveaway....love this idea!! I love DIY and craft projects, and The Makers seems like such a cool concept! I would love this is a gift for Christmas! i love diy's. i feel a pride when i do things myself! I love everything about DIY projects! I am constantly making things and starting new projects! I just like trying something new. Ever since my daughter was born, I just feel like being creative! It's been such a joy!! I love DIY projects because it allows me to be creative! I love creating something so lovely I'm proud every time I see it. Great giveaway! Love DIY projects! I love the excitement of accomplishment after finishing a project! What a great idea, and a great giveaway!! I would love to win! I'm sad it closed so early and I missed my chance. Was this only open for a few hours? Already ended? Too bad! It's a great concept! Sorry ladies - it is back open!! There was a mistake on the end date. I love DIY projects because the satisfaction of making something yourself is so much more rewarding than just buying something. I love For the Makers! This would be sooo fun to win! Crafting is the best! I love diy because when you are done- and people say- where did you get that?! you can say i made it! and say it proudly! I love this idea.. how beautiful. Being creative while inspiring others to do the same. Love it! I've been exploring craft and DIY a lot this year to great joy :D I would love something like that, to get to try new things or different technique. i love giving away my diy projects. it's more fun to make things when you know that they will be given away and loved by someone else. This is awesome! I love making crafts and seeing the tangible result of sometimes hours of work. The biggest challenge that I run into is gathering all of the supplies. I either forget something, or I can't decide what tool/supply to actually use. This idea from For the Makers is perfect for that. I was so excited about For the Makers when you initially posted about them that I immediately put a For the Makers subscription on my Christmas list! Great idea! Would love to see how different the projects turn out based on the same supplies! i like learning new techniques and sharing what I learn each time I take on a new craft. There is great satisfaction in knowing you have made/created/repaired/repurposed something. What a cool idea! DIY projects are ultra-loveable because they get my/your weird imaginings out into the world in a tangible way that is (hopefully) useful or pretty! Wow! I would love to win this give away! A few months of "for the makers" is on my Christmas List! I love learning how to do new things and having a finished product at the end that I am proud to give as a gift or keep! Creating things is so fun. I just love seeing the result of my own creation. It's very rewarding, especially when others admire it. I love DIY because it can be eco-friendly if you pick the right projects and materials. Also because I get to be creative! I've been looking into these and would love to try it out! Thanks. What a cool giveaway! Thanks! I love this, what a wonderful gift!! I love that DIY projects allow you to focus on one thing in the moment. Personally, it allows me to relax because I'm only thinking about the task at hand. Making something cute that you can be proud of doesn't hurt either! I would love to win this! I would be giddy with anticipation of the crafts coming my way...so cute! The best thing about DIY projects and crafts is the feeling of accomplishment when you're done -- "Wow! I just made that!" I've entered so many giveaways this week! Hopefully I'll win something! Thanks! I love DIY projects because they're made with love. It always makes others happy and special to receive a handmade gift, way more so than a store bought one! I love how relaxing and enjoyable it is to DIY something, and then how accomplished I feel after! I'd love to win this - it would be like a kick in the pants to actually do something instead of just thinking about all the projects I'd like to start and/or finish! I love DIY and this idea... it lets you try so many different things and personalize what you already have. They look so easy to do but turn out so adorable! Love this! and it is such lovely gift idea! I love testing new ways to create things, DIY are perfect for that ! I have always wanted to get one of these! I like the satisfaction of knowing that I made something aweome that was much cheaper to make than to buy! This is great! Thanks so much for a chance to win! I love that DIY/crafting/etc allows me to relax, create something for someone else, and share my love through a simple gift. Wow what a cool idea! I love DIY projects because they make me feel accomplished and good about myself. :) I was born without one of my hands and I think on a subconscious level I enjoy DIY's so much because they make me feel like I'm not "broken" and can still do things with my hands. That probably makes no sense but oh well. ha, thanks for the great giveaway! I love DIY projects! There's nothing like the feeling of looking around your home and seeing it filled with things that you put the hard work into making. It makes your home feel that much more special and unique. I love diy ideas crafts because you get to create what and how you want. Really all tutorials are are tips to get you started. love diy's! so unique! Love love love!! I love knowing that I accomplished something! This sounds like such a great project. I'm a craft-fiend, and love making things I can feel proud of. DIY projects are so cool because you get to customize things and it's pretty much in your control how they come out. Love them! Always have. Craft time was definitely my favorite period in elementary school. This is a great idea, and the crafts are really nice. I would love to give this as a gift for some of my favorite crafters. I love that I can create quality items that carry a lot of love and don't cost an arm and a leg. I love DIY projects. Its a great way to spend time plus it add personal touches and character to whatever you make. I feel a great sense of pride whenever I see something that I made myself at my house or someone elses. I love how there's really no right or wrong with diys--just do what you want with what you have! Sounds like a great idea! I love DIY because it means so much more to know that you put your time and effort into making something, especially if it turns out well! What a cool idea! It's nice that they give you everything you need so that you don't have too little or too extra when you're finished! What I love most about DIY projects is the sense of fulfillment that I get from creating something useful and being able to use it, whether for myself or to give as a gift. I just saw these in Anthropologie today--so sweet! Thanks for the great giveaway! Love DIY. A great way to exercise your creativity either on your own or with friends! I love DIY projects because you can create things exactly how you want them, or create them exactly for certain people! This is by far the best giveaway I've ever seen. Please enter me! Love DIYs and everything craft! Such a neat idea to get a bunch of assorted things...would love to try the projects! 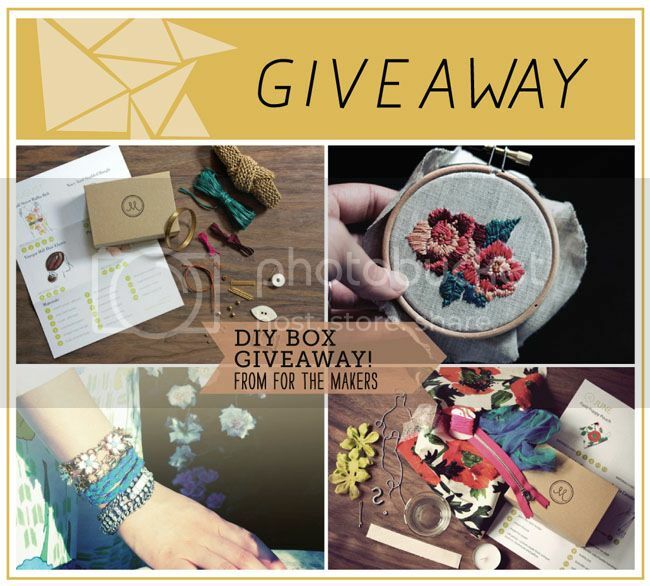 Would love to WIN the giveaway from FOR THE MAKERS - what fun it would be to create things from this gift with my 13 year old daughter. What a great idea! I would love a craft-a-month! I love that DIY projects are so personal. Every person could make the same thing but each craft would turn out differently! The sense of accomplishment! Plus it makes me want to make something for everyone I know. What I love about diy projects is that they let youir imagination explode and they can transform something dull into something anchanting! DIY projects give my creative side a needed workout. I'm jealous of my kids' Kiwi Crate, and this subscription would cure me of my envy! I'm so glad you posted about this because I always end up with tons of leftover supplies that need a new home. Fantastic! Who doesn't love an old fashioned DIY? I'm so very excited for this giveaway! Thank you for the opportunity! DIY allows you to journey the creative side of yours with no limitations. Wow, this is such a cool idea! I love DIY because it's so great to customize something to exactly what you want and learn new skills at the same time! Love love love this idea! Sometimes it's so hard to choose what DIY project to start on so this is a great way to bypass that part and get to the craftin'! so wonderful! i love how you receive everything you need to complete a project-- no more partially completed DIYs! I love all DIY projects; they make me feel empowered, I guess. It's like, no matter what it is, I know I can find a way to make something similar or even nicer! what i love most about diy projects is how unique they always turn out to be. even if two things are made with the same color materials or with the same design, the method and mood the maker has changes it all. in many ways a handmade project, especially a handmade gift is a heartfelt message to another. I love to take part in any DIY project with my favorite artist, my mother! Getting to create something with her is wonderful but the memories shared are beautiful all together. These kits look fantastic! They should really consider shipping to Toronto! I am truly inspired by these creative ideas! I would love to have one of the kits, especially in time for the holidays so I can make small special gifts for my friends! I love the satisfaction of using something you made with your own two hands! I lov DIY projects! I especially love doing something other than my day to day embroidering and stitching for my shop so I love a good new project to mix things up a bit! DIY projects are so fun! Creating something with my own hands, make me feel empowered! And smart! It's always nice to be able to make something cute with my own hands. I absolutely love creating. It just soothes something in my soul. I think that there is a special connection between doing something with your hands and the one for whom youre creating. Its a special, unique soul connection of saying "You are worth my time". Creating is my way of loving. DIY takes me back to when I was a child and the joy of creating something that is all done by oneself! Wonderful idea! I love it! I love making new projects -- my art room is kind of a mess, but it's such a fun spot. I always have various crafts going on :) I'd love to win this contest and have a few more cool projects to work on! I like DIY things because sometimes you can end up passing them down through the generations and it's always awesome to have something a loved one made! Wow: this looks amazing; thanks for the chance. What I love about DIY projects is that YOU made it so no one has it and its YOURS! TY for the chance to win and for also linking the site. I had never heard of them before. Oh, I never heard of "For the Makers" before, but this such a great idea. Especially as one will get to know crafts that you probably wouldn't try otherwise. I love the memories attached to a piece I make myself. I love this idea! Thanks for sharing and giving it away! OMG~ the Makers are genius. It's so exciting! I like that I've got my hands in DIY projects. The I did it! makes me happy. DIYs are great stress relievers and allow you to forget about everything else and just enjoy creating something beautiful! If you don't have the $$$ to buy something expensive, you can most likely make it for less then half the price. And if you make your DIY together with the family it's even more fun. I love the process of taking different materials and transforming them into something useful and/or beautiful to look at. How fun! Love this idea. How exciting! Fingers crossed :D Thanks! I love, love this giveaway. Thank you for the introduction to The Makers! I love the opportunity to transform simple, everyday objects- take some christmas ornaments and make a chandelier, or turn a silverware caddy into a lamp, or some old canvas into a map... I love the endless possibilities! I love the look on peoples' faces when I give them a present of something I made. Oh! What a lovely giveaway! I've always dreamed of a box like this, and sharing the making with my daughters would be divine. You had me at box full of craft stuff. This issues a wonderful idea! I loved DIY but hate seeing boxes of craft items I used for just one project cluttering my room. This is genius.